Brett McCracken was a classmate of mine at Wheaton College and it has been fun to follow his writing career from a distance over the past few years. His first book, Hipster Christianity: When Church and Cool Collide, was a unique and thoughtful look at many of cultural realities of Christianity. But I was especially excited about his second book, Gray Matters. It covers a topic I care about a lot and one I hope to see the church engage more and more thoughtfully. Brett’s gracious voice and careful exploration is a fantastic contribution, and I was excited for the opportunity to review it for Winter 2014 edition of Leadership Journal. I am re-posting it with permission. The Facts:“Christians have a hard time with nuance. 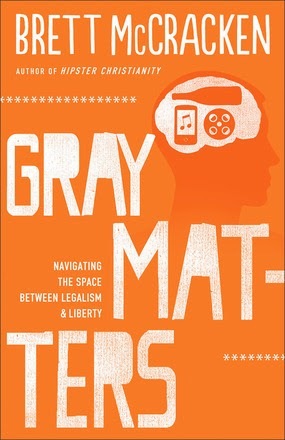 Gray areas are not our strong suit.” So says Brett McCracken in Gray Matters. He has a point. When it comes to popular culture, we often struggle with balancing engagement and discernment. It is much easier to say “yes” or “no” to things and far less satisfactory to say “maybe” or “sometimes,” even if those are wiser answers. This book explores four of the most complex, and divisive, categories of culture we consume: food, music, movies, and alcohol. It does not defend all culture nor categorically condemn it. The book seeks to help Christians learn how to be discerning consumers of culture so that we can truly appreciate God’s creativity and glory in it. The Slant:McCracken is a journalist, movie reviewer, and self-described foodie who travels widely. All this contributes to his keen sense of popular culture. And as someone who grew up in the church, he brings an insider’s understanding of the Christian sub-culture. Gray Matters is an effort to close the divide between the two by equipping readers to think more carefully about culture while demonstrating greater sensitivity toward fellow believers. McCracken meticulously explores the divisive aspects of popular culture and strikes a balance between mindless acceptance and reactionary rejection. He asks readers to rest in the gray areas, no matter how uncomfortable it may be, for the sake of honoring God and loving each another.